during the Monster Energy NASCAR Cup Series First Data 500 at Martinsville Speedway on October 28, 2018 in Martinsville, Virginia. 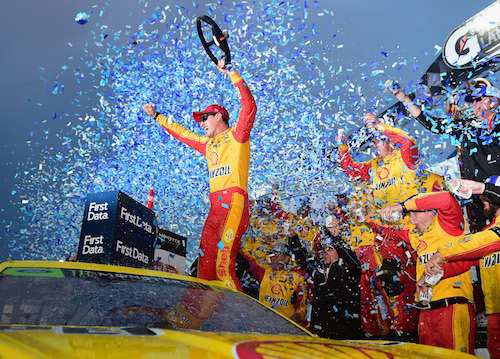 Joey Logano dominated the First Data 500 at Martinsville (Va.) Speedway on Sunday, leading 309 of the 500 laps that made up the race en route to his second win of the 2018 Monster Energy NASCAR Cup Series season but his first-career win at Martinsville. With the victory, Logano locked up his spot among the championship four in next month’s season-finale at Homestead-Miami Speedway. Logano lost the lead to Martin Truex Jr. briefly on the final lap, but with contact, he retook the lead for the win. Denny Hamlin also got by Truex, as a result, to finish second. Truex wound up third. Kyle Busch finished fourth and Brad Keselowski rounded out the top-five a week after his elimination from the playoffs. Truex and Keselowski started the race in the back, Truex becasue of a failed inspection and Keselowski because of an unapproved change to his car prior to the race. Busch was dominant early, leading 100 laps of the first 130-lap stage after starting on the pole. Hamlin, though, won the opening stage after twice taking the lead from Busch during the stage. Logano won stage two after getting out of the pits first during the caution between the first two stages and leading most of the second stage. His dominance continued through the third stage that accounted for most of the second half of the race. He lost the lead to Truex briefly on lap 360. Keselowski took the lead from Logano on lap 419, but when the yellow flag waved on lap 457 for the eighth and final caution of the race, Logano retook the lead by getting off pit road first. 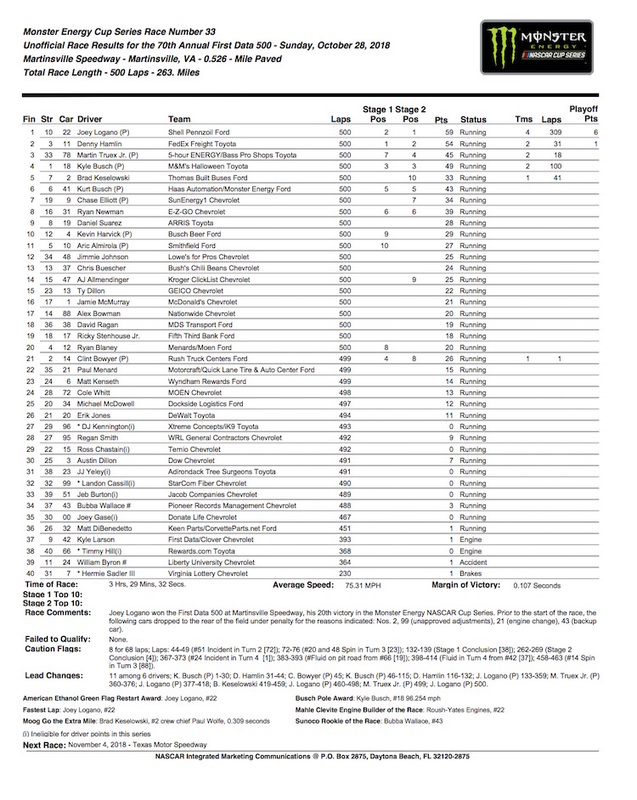 Once Truex raced into the top-10 of the running order by lap 120, the eight playoff drivers ran inside or just outside the top-10 throughout most of the remainder of the race. Playoff driver Kevin Harvick, though, did briefly fall off the lead lap. Although he was racing inside the top-15 late in the second stage, Logano lapped him in the closing laps of the stage. But Harvick got back on the lead lap when the second stage ended, courtesy of the free pass during the caution to start the final stage. Harvick got back inside the top-10, finishing 10th. Two of his Stewart-Haas Racing teammates, Aric Almirola and Clint Bowyer, were the only two playoff drivers outside the top-10 at the checkered flag. Almirola finished 11th. Bowyer wound up 21st as a result of a late-race incident with Jimmie Johnson. Caution-causing incidents included two fires. Timmy Hill’s car caught fire near the right-front wheel well, resulting in the sixth caution on lap 382. Larson’s car, then, caught fire on lap 397 when his engine blew. Other top-10 finishers included playoff drivers Kurt Busch and Chase Elliott in sixth and seventh and non-playoff drivers Ryan Newman and Daniel Suarez in eighth and ninth.